Review: Set in a Connecticut suburb during the mid-1950’s. Frank and April are struggling to come to terms with their personal problems while they try to raise their two children. This film reunites three of the Titanic starts. Leonardo DiCaprio, Kate Winslet and Kathy Bates. I felt it didn’t really work Leonardo DiCaprio and Kate Winslet being the lead actors. As good as they both are. Brilliant acting and the cinematography is well done. I often wonder is this what their lives would have become if they had survived Titanic? 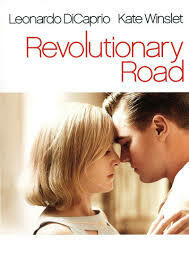 Based on a novel by Richard Yates. I have given this film a low rating because although it is very well acted it is extremely dreary and depressing and has not really got a decent plot to hold your interest. At the Golden Globe Awards in 2009 Kate Winslet won for Best Performance by an Actress in a Motion Picture – Drama.